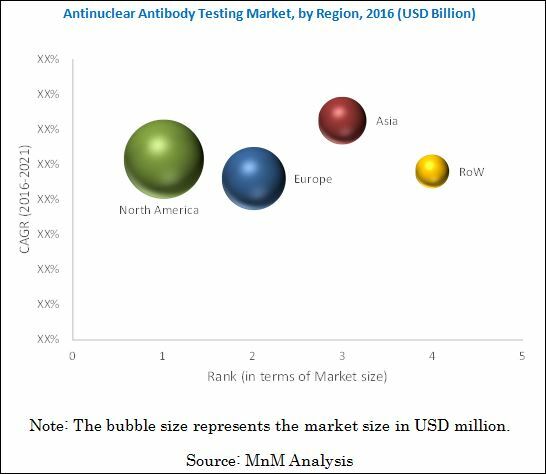 The Global Antinuclear Antibody Test Market is expected to reach USD 1,476.1 Million by 2021 from USD 823.5 Million in 2016, at a CAGR of 12.4%. In this report, the ANA testing market is broadly classified based on products, diseases, techniques, end users, and regions. Based on products, the Antinuclear Antibody Test (ANA Testing) Market is segmented into assay kits & reagents, systems, and software & services. The assay kits & reagents segment is expected to account for the largest share of the global ANA testing market in 2016. The growth in this segment can majorly be attributed to the growth in the number of reagent rental agreements and increasing prevalence of autoimmune diseases. The market is segmented into five major disease segments, namely, rheumatoid arthritis, systemic lupus erythematosus, Sjögren’s syndrome, scleroderma, and other diseases. Other diseases include Raynaud’s Syndrome, polymyositis, mixed connective tissue disease, drug-induced lupus, and autoimmune hepatitis. The rheumatoid arthritis segment is expected to account for the largest market share, primarily due to the increasing incidence of rheumatoid arthritis. Based on techniques, the Antinuclear Antibody Test Market is segmented into enzyme-linked immunosorbent assay (ELISA), immunofluorescence assay (IFA), and multiplex assay. The ELISA segment is expected to account for the largest share of this market due to the expanding applications of ANA in autoimmune disease testing and therapeutic drug level monitoring. The end user segments in the market include clinical laboratories, hospitals, POLs, and other end users. The hospitals segment is expected to account for the largest share of the global ANA testing market in 2016. Growth in this segment can be attributed to the fact that most diagnostic tests are performed in hospitals or hospital-attached laboratories, primarily due to easy access to reports and smooth logistics. North America is the largest regional segment in the ANA testing market, followed by Europe, Asia, and the Rest of the World (RoW). Growth in the North American market is primarily driven by the high incidence of autoimmune diseases, growing population and healthcare spending, and growth in the number of individuals covered under medical insurance in the U.S. The major players in the antinuclear antibody test market are Alere Inc. (U.S.), Bio-Rad Laboratories, Inc. (U.S.), ERBA Diagnostics, Inc. (U.S.), Trinity Biotech plc (Ireland), Thermo Fisher Scientific, Inc. (U.S.), Antibodies, Inc. (U.S.), EUROIMMUN AG (Germany), Immuno Concepts (U.S.), Inova Diagnostics (U.S.), and Zeus Scientific, Inc. (U.S.). This report aims to provide insights into the global antinuclear antibody test market. It provides valuable information on the products, techniques, and diseases in the ANA testing market. Details on regional markets for these segments are also presented in this report. Also, leading players are profiled to study their product offerings and understand the strategies undertaken by them to be competitive in this market. The abovementioned information will benefit buyers by helping them understand the market dynamics. In addition, the forecasts provided in the report will enable firms to understand the trends in this market and better position themselves to capitalize on growth opportunities. The ANA Testing Market is segmented based on products, diseases, techniques, end users, and regions. On the basis of products, the ANA testing market is segmented into assay kits & reagents, systems, and software & services. The assay kits & reagents segment is expected to account for the largest share of the global market in 2016, primarily due to the growing number of reagent rental agreements and increasing prevalence of autoimmune diseases worldwide.